Percussion plays a supporting role in creating music that is pleasing to the ear, but it can be much more than that! In this class we will explore different percussive instruments including cajons, hand drums, tambourines, various “shakers”, a full drum kit, and many others. We will learn how to create percussion with what we have at hand. We will focus on common time signatures (4/4, 3/4) but also explore other timings. We will explore folk, country, rock, swing, reggae, Latin, and other rhythms. We will discuss how to choose percussion instruments based on the type of music you play most often and the sound you want to achieve. Learn how to tastefully support other players in a band or jam session. Learn the secrets to becoming the percussionist that other musicians want to have around! This class will go beyond the drum circle into the playful realms of STOMP as we learn how to keep time using our bodies and instruments to enhance or even create a song. Suzi is a local musician who has been playing music and singing for over 30 years. She started percussion classes at age 7 and played percussion with both the Concert and Jazz bands in Junior and Senior High School. 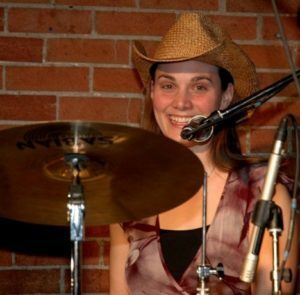 She is currently a percussionist with the Riverside Jazz Band in Cochrane, Alberta. She has performed with several bands in the Calgary area, playing a variety of instruments including drums, guitar, banjo, bass, and others. She has taught music in the Calgary area for 7 years and is a returning FAMI instructor. Suzi is a two-time finalist in the Calgary Folk Festival Songwriting Contest. She is happy to teach any age and believes that playing music should be enjoyable and fun.